Ignoro lo que debe darse lugar en las páginas y lo que hay que dejar a un lado. Supongo que debe ser lo más importante de la vida. Pero entonces ¿qué es lo más importante en la vida? I don’t know what should be in these pages and what should be left out. I suppose it should be the most important things in life. But then, what are the most important things in life? 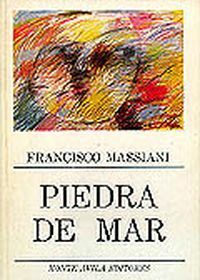 Reading Francisco Massiani‘s Piedra de mar (Monte Ávila: 1968) today, it is easy to miss its significance. We’ve become used to youth language, to stream-of-consciousness, to the bored and self-obsessed teenager as protagonist. However, on its release, Massiani’s debut novel caused a stir for its radical rupture with traditional, national narrative. It has since become a Venezuelan classic itself, often included in school reading lists and frequently cited as an influence on contemporary writers. Piedra de mar is the story of Corcho, who is painfully shy, depressed and lonely, despite seemingly spending all of his time with friends. Corcho tells us of his struggles and his sadness, encapsulated in the love for Carolina which he is unable to express to her. Massiani’s brief novel is often compared to Salinger’s The Catcher in the Rye (1951), as there are multiple similarities between the two in terms of both protagonist and narrative technique. Corcho is individualist and self-absorbed; the novel takes us into his head and attempts to make us share his angst. Written when Massiani was just 24, it is a document of the youth language and culture of the 60s in Venezuela, but the emotions are those that every teenager supposedly goes through at some point. As the blurb for Piedra de mar advertises:.”La suya es una prosa […] que no tiene ningún respeto por las palabras” [His is a prose that has no respect for words]. Just as he cannot vocalise his feelings for Carolina, Corcho’s stream-of-consciousness prose suggests an inability to neatly verbalise his excessive emotions, as well as a rebellion against literary tradition. In fact, Corcho is writing a novel throughout Piedra de mar, making the novel a self-reflexive exploration of the nature of writing. “Creo que hace millones de años, la gente necesitaba contar algo. Quiero decir: el escritor cuando se ponía a escribir quería decir algo […] Pero llegó el día que al escritor le importó más la forma de contarlo que lo que podía o no contar y se puso con las jeringas, y tijeras, y a cambiar una palabrita para acá y otra más arriba, y blá blá blá, hasta que llegmaos a nuestro siglo y todo lo que se escribe es un asco”. “I think that millions of years ago, people needed to say something. I mean: when the writer sat down to write he wanted to say something […] But the day came when the writer cared more about the form of the story than what he could or could not tell and he got the needles and scissors and changed a little word her and another up there and blah blah blah, until we arrive at our century and everything that’s written is revolting”. Piedra de mar has become mythologised. Every writer seems to have a story about where they first read it or how it affected their lives. Even its inception has become a legend. One of Massiani’s favourite stories is about how when he met Simón Alberto Consalvi, who was just about to set up Monte Ávila, Consalvi asked him whether he had a ‘short, fresh, youthful’ text. He replied yes, of course, even though he had nothing of the sort. He then ran straight home to write Piedra de mar, a story he had not even considered before, and after a year and a half of frantic writing, a classic was born.